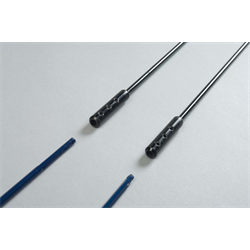 The Freeform Flexible Series Extensions are designed to offer the same functionality as the standard extensions and are also able to be used for a much smaller hole diameter of down to 3/8” while retaining the strength and flexibility required. They have a unique 3 set screw configuration to provide a secure lock. Ideal for low voltage wire paths where smaller drilled holes can be used. The use of an AT-7 Directional Tool is recommended for any long drilling situation. Note: The use of mixed diameter shaft sizes when using in conjunction with other extensions is not recommended. Freeform Flexible Extension 3/16" shank for 3/16" EXT 55" long.